Brett has the sweet tooth in our family, so he is always hoping I have some dessert in the meal plan. Baking is not my favorite, too much measuring and clean-up, so I’m always looking for easy recipes that make us both happy. “More-with-Less” delivered again with the “Coconut-Custard Pie.” It only has seven ingredients, six of which were already on hand. I only had to buy the coconut. Plus, there were minimal items to wash afterwards: one measuring cup, one liquid measurer, and the food processor. While Hannah was finishing up dinner in her high chair, I set up the food processor on the table and lined up all the ingredients. I decided to make my own mini cooking show. We named all the ingredients as I put them in, she already knew eggs and milk. Then we mixed it up; she loves watching everything spinning around in the food processor. So easy – I just poured it out into the pan and stuck it in the oven. Blend several seconds. Pour into a greased and floured 10″ pie pan, or two 8″ pans. Bake 50-60 minutes. Pie forms its own crust. 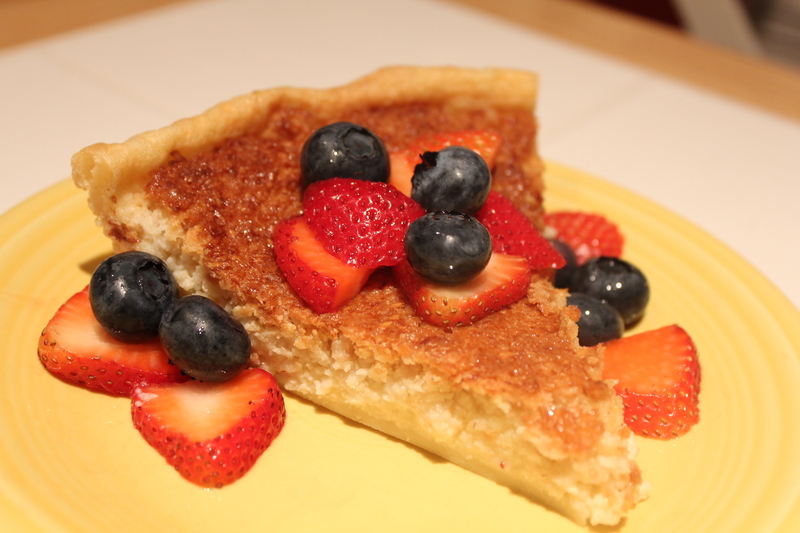 This was very quick to whip up and the toasted coconut then the baking pie made the house smell so good. 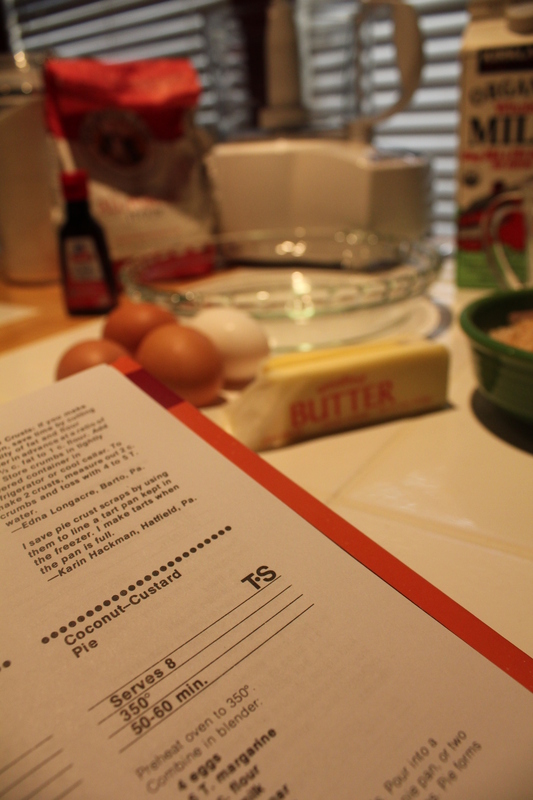 I estimated the pie cost less than $3.50 for ingredients which even included cage-free eggs, unbleached flour, and organic milk. We cut it into six nice slices, so that’s around 58 cents a serving. Sweet! It is truly amazing how you can just blend up all the ingredients then while it’s baking it makes a crust, custard layer, and crunchy coconut topping. I added some fresh berries. Easy and affordable for the summer sweet tooth. As I have mentioned on here before, I have a hard time with lunch. Sometimes I have leftovers, sometimes I eat the same thing as Hannah, sometimes I do a fridge clean-out salad. When none of those options are enticing my taste buds, I turn to the freezer. My favorite go-to freezer lunch is Buffalo Fake Chicken. So easy. 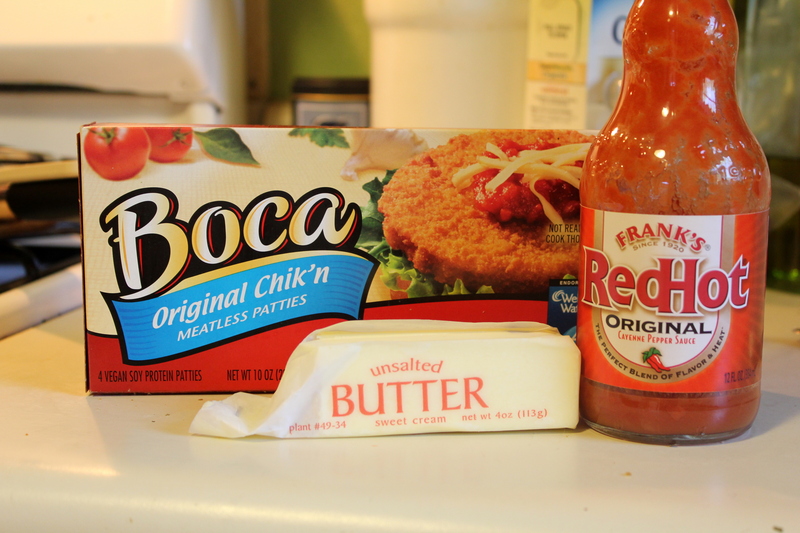 Just cook two Boca “chik’n” patties (12 mins in the toaster oven) and make a little buffalo sauce (approx. 1 T. melted butter and 1 T. Frank’s). The Boca patties have less fat and more protein than normal processed chicken patties. And the texture is just like chicken; I actually prefer the texture and taste to real chicken patties. They can be pricy, so I stock up when they go on sale. Frank’s is my favorite. If I was stranded on a desert island and could have two condiments, I would have Frank’s Hot Sauce and dijon mustard. Anyway, I cut the fake chicken patties into bite-sized pieces and mix them with the buffalo sauce. Spicy, crunchy, chickeny, yum. I do not enjoy cleaning. My house is sanitary and all, no random roaches or health code violations. But the sink has a pile of dirty dishes, there’s a toddler trail through the house of discarded items and the floor is in desperate need of a scrub. I’ve never been successful at developing a cleaning schedule for myself, though many people swear that is the only way to keep up. I’m very convinced I will have more time tomorrow for whatever needs to get done. Then tomorrow comes, not so much. And my unwillingness to clean didn’t start when I had a toddler. No, I’ve never been a fan. And Brett doesn’t really seem to care either if I’m behind on dishes or the bathrooms are not exactly sparkling clean. So I don’t care, he doesn’t care, and Hannah hasn’t complained. So what’s the problem? In an attempt to seek help, I downloaded the e-book “31 Days to Clean – Having a Martha House the Mary Way.” I even spent $4.99 on it. Each day, you read about a heart attitude or a practical reason for keeping up with those chores. Then there is a Mary challenge which is more emotional and introspective, and a Martha challenge which is a systematic, thorough cleaning project. The Martha challenges are more like big “spring cleaning” tasks, not daily upkeep, but they are divided nicely into do-able projects that one could do in the 31 days if desired. I read the entire book and was thoroughly convicted by the heart attitude inspection. As part of basic hospitality, I should have a house that is comfortable and welcoming at any time. Not necessarily spotless and scrubbed, just free of clutter and ready for unexpected guests or playdates. I had a real-life example of this when one of my neighbors locked herself out of her house a couple weeks ago on a hot day, and I invited her in to hang out until her boyfriend came home with the key. You never know when there will be a guest in your home. As well, I should be a good steward of the house that God has blessed us with and maintain it to the best of my abilities. It is honoring to God and to my family to have a clean, organized environment. There were many references to the Proverbs 31 woman, and one of my favorites was about v. 15 which makes reference to her servants. We could say, of course this amazing woman can do all this, she has servants! However, the book points out, as 21st century women, we may not have actual human servants, we are blessed with modern appliances which do so much work for us. My “servants” include a washer, dryer, and dishwasher. I just need to get them started! The Martha challenges were… challenging. Honestly, I did not do a single one. I have good intentions of going through the book again at some point and actually tackling each day’s task. 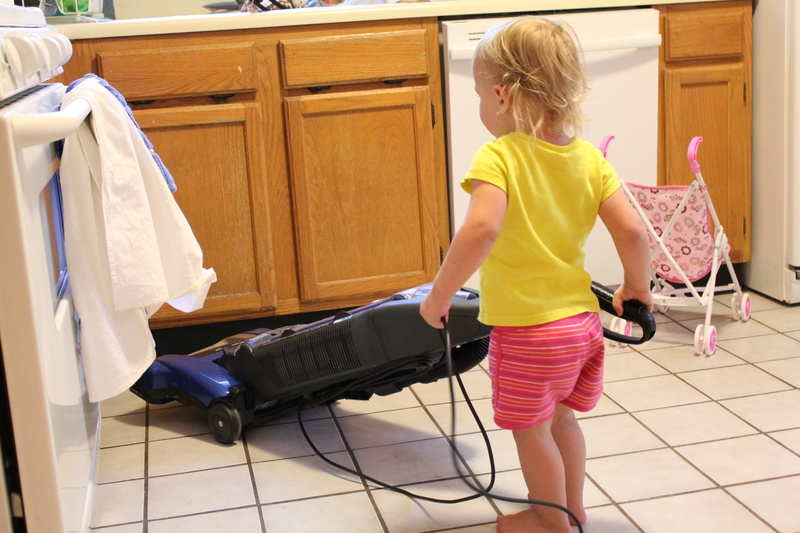 I felt a little overwhelmed taking on her daily projects when right now I can’t even keep up with the day-to-day tasks I should be working into the schedule. I think I’m going to try doing a cleaning schedule (again) and really committing to sticking to it. We are having several houseguests in September and October, so I’d love to have a successful routine down by then to avoid the panicked pre-guest house attack. How do you get motivated to clean? Any tips to staying on a schedule? Yesterday was our nine-year dating anniversary. On that day, in 2002, Brett asked me to go out for ice cream after a Campus Christians event, and I replied yes, if we could take along my friend Lydia. I knew at this point that this guy could be The One, and I wanted official friend approval before actually dating him. Being the great guy that he is, he was not thrown off by a third wheel on our first date (though I was a little afraid he’d prefer the cute blonde over me). Once we’d eaten our ice cream and made small talk, Lydia gave me the official okay and pretended she had to go study or something. So Brett and I walked around Potter’s Lake for a couple hours and talked about life. July 23, 2002. It may be silly to celebrate our dating anniversary, but it’s a bigger number than our wedding anniversary, so it makes me feel like we’ve “accomplished” more. And our wedding anniversary is a week after Christmas and a day after my birthday – a festive time but somewhat squeezed in between other celebrations. Our dating anniversary falls nowhere near any other holidays, so it’s fun to have an excuse to plan something special. 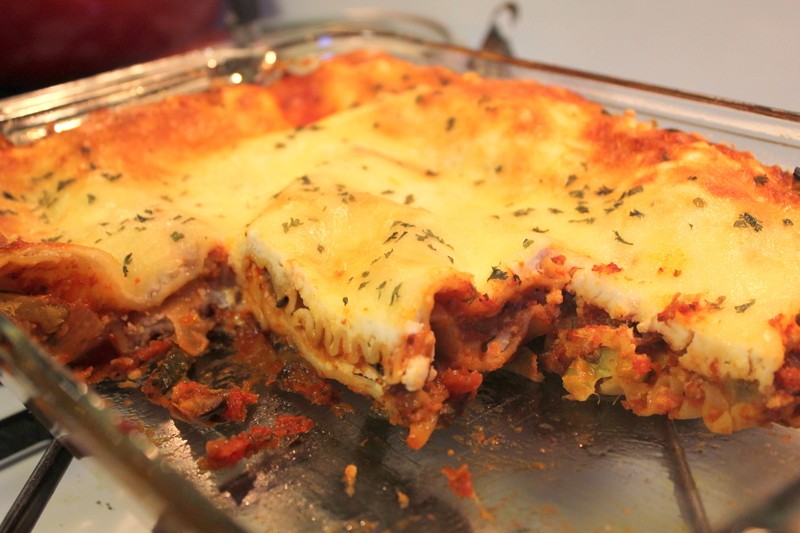 For dinner, we stocked up at the farmer’s market and made a roasted vegetable lasagna. I roasted eggplant, zucchinis and onions (all locally grown), mixed with sauce and layered with cheese, ricotta, and those easy no-cook lasagna noodles. I prefer the texture of traditionally cooked noodles over the no-cook variety, but for this I choose convenience. I don’t know who could look at this and say that incorporating seasonal, local food requires some sort of sacrifice and deprivation. Add some garlic bread and there’s dinner. Hannah loved it. Yes, our daughter eats roasted eggplant. And hummus, but that’s another post for another day. 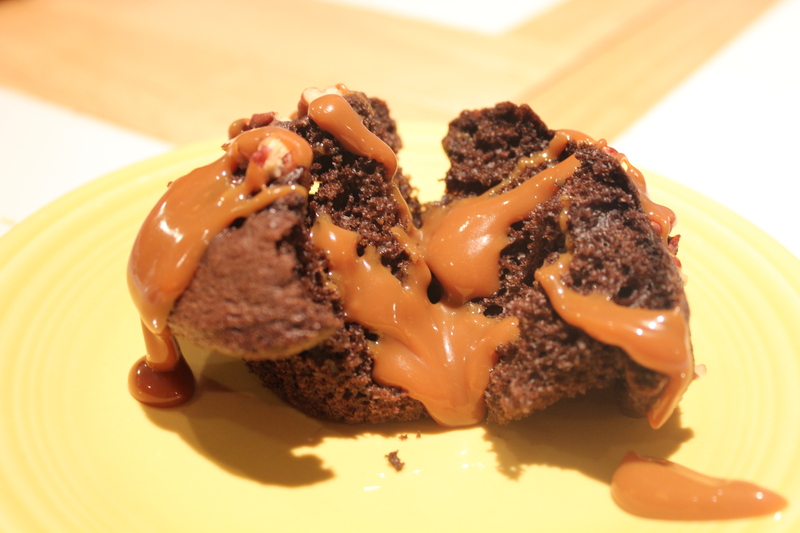 Dessert was a basic cupcake from a dark chocolate cake mix with pecans sprinkled on top. However, we “kicked it up a notch” with a drizzle of dulce du leche that my brother and sister-in-law brought from their trip to Argentina. This was Brett’s, hence the generous drizzle. Earlier, he ran a quick trip to the store to pick out a complementary wine for our anniversary meal. Apparently, this one was on sale, so he grabbed it. I love the label. 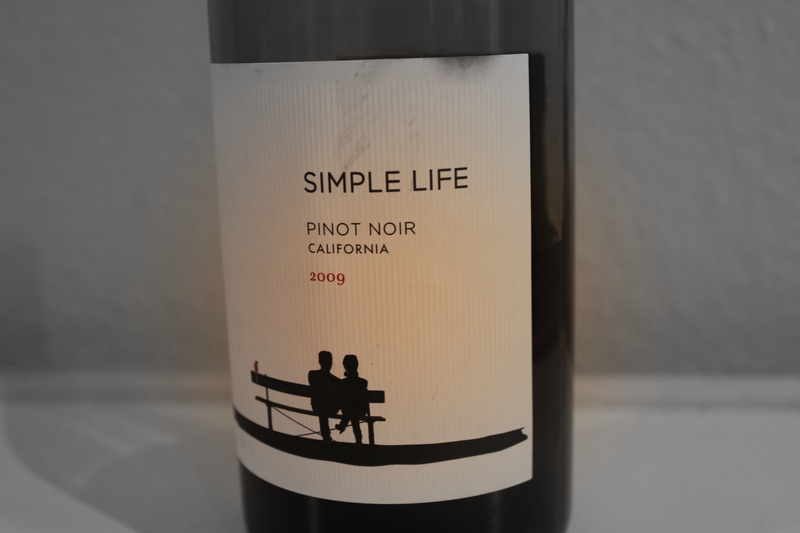 We mutually agreed this is not our favorite Pinot Noir, but the label was perfect for the occasion. From our first date, sitting in a park and discussing the future, to now, we’ve had a good simple life. Our chicken nuggets have been such a success that Meghan and I decided to add meatballs as a group cooking project. She even had a “secret” family recipe for us to use. Very easy – ground beef, spinach, breadcrumbs (homemade), egg, herbs, garlic and onion. This recipe appealed to me because of the spinach – extra nutrition and great flavor. 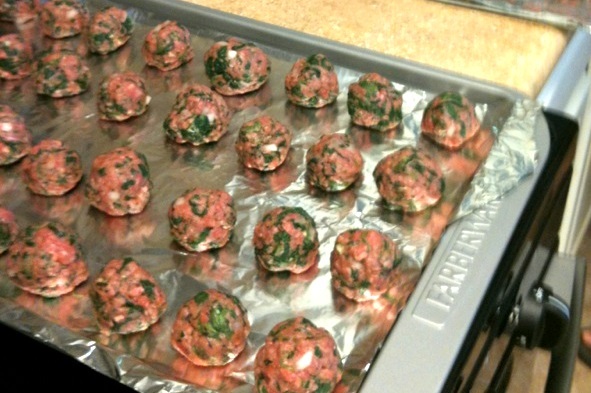 And pretty, the little meatballs looked like marbled pink granite before we baked them. They take longer to bake than the chicken nuggets, but the whole process seemed to go faster. And since they bake longer (and make the house smell amazing), we had some down time to just talk and chase down the kiddos who were hiding in a built-in entertainment cabinet. 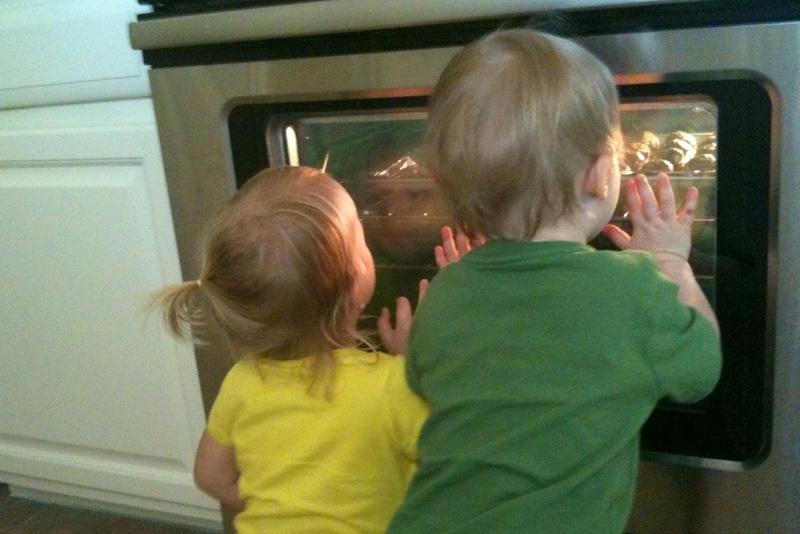 Hannah and Cody really liked watching the meatballs cook, though, and would come look through the window periodically to make sure they were still there. After tasting the finished product, we agreed it could have used more salt, so we decided to positively brand this batch as “low sodium” and “heart healthy.” Good on their own but really tasty covered in sauce. Hannah didn’t like them, but she’s in one of her food funks again and only wants to eat toast, smoothies, and popsicles. I’ll freeze the extras, and I’m pretty sure the next time I pull them out she’ll be a fan. And there are lots of options for using meatballs – plain, on pasta with sauce, in a pita or on a sandwich, sliced on pizza, or stuck with a cute toothpick to look like a fancy appetizer. When they’re frozen, they only take 30 seconds in the microwave and they’re ready to enjoy. Yum! There’s just something about standing at 14,000 feet and looking out at the world below that is just breathtaking and magical. Ok, physical exertion at an altitude of 14,000 feet might actually be what is taking my breath away, but it’s still magical. There are only four states in the US that have peaks over 14,000 feet (affectionately referred to as 14ers), one of them being the colorful state of Colorado. Colorado has 54 14ers and is located next to my home state of Kansas, so in addition to being colorful, Colorado is also terribly convenient. 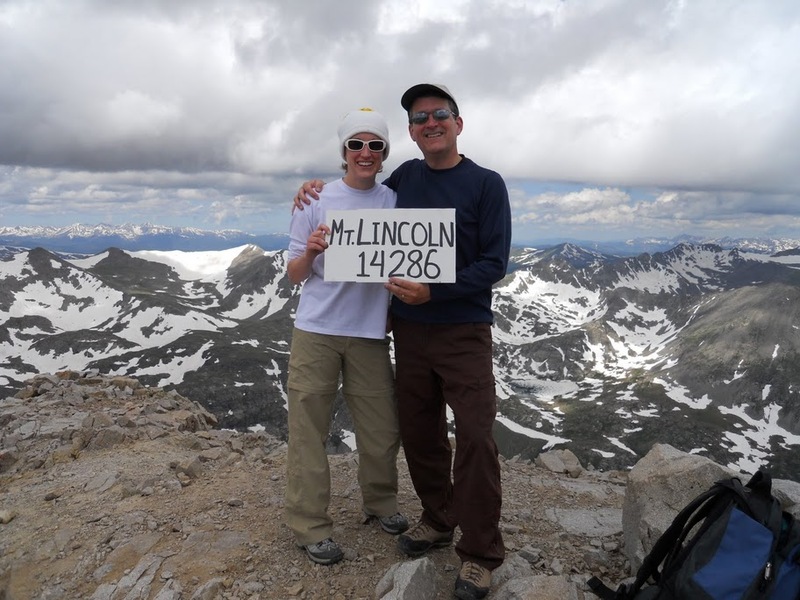 In the last five years, my dad and I have hiked ten 14ers: Grays, Torreys, Longs (on Dad’s 50th birthday! ), Missouri, Quandary, Elbert, Democrat, Cameron, Lincoln, and Bross. 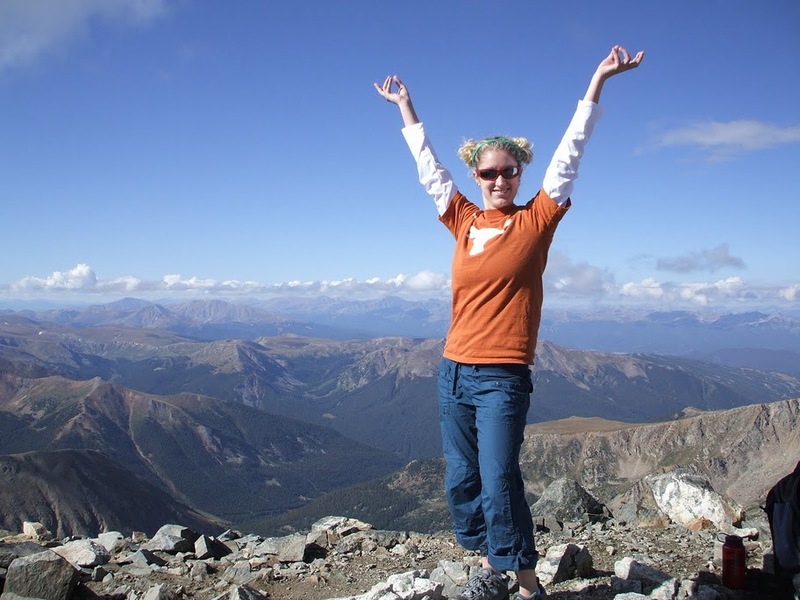 Some people (like my sister) think hiking 14ers is crazy/awful/nutso/etc. Honestly, it’s not an activity for everyone, and I know that, but here are a few reasons I’m a huge fan. The Physical Challenge: The shortest 14er hike I’ve done was about 6 miles, the longest was 14 miles. It’s slightly comparable to climbing straight up a staircase for three miles (or seven), then going straight down a staircase for three miles (or seven). 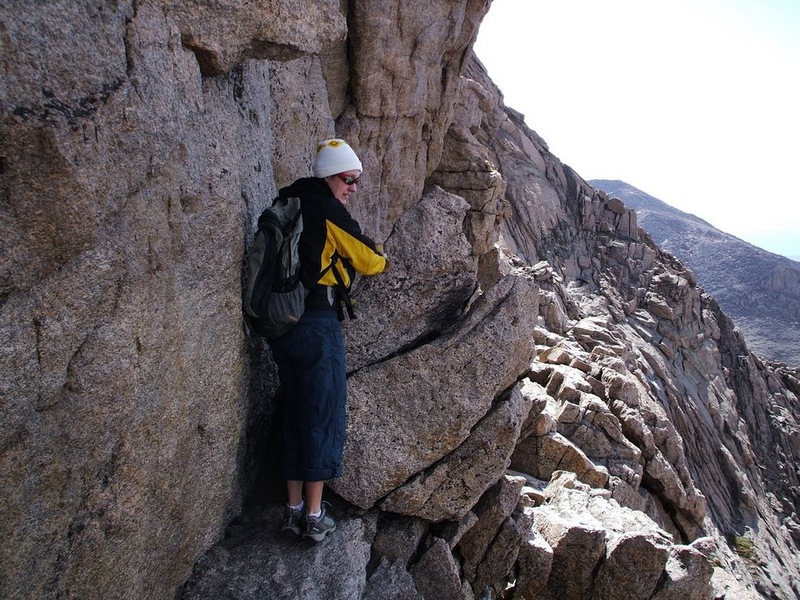 But 14ers are a lot prettier than staircases! It’s a great challenge to train for. It’s actually one of the reasons I stay in shape. I Like Being Outside: I work in an office all day. I like my job, but it’s really nice to have an activity that is an excuse to be outside! It Makes Me Feel In Perspective: This is probably the biggest reason I hike 14ers. In my everyday life, I gravitate toward stressing out about insignificant details. Hiking a 14er, it’s you, your pack, God, and the mountain. All of a sudden, the feelings that someone returned a work email in ALL CAPS, that the projector at a recent presentation was way too fuzzy, that some guy sends mixed messages but doesn’t actually like me, or that I haven’t gotten my eyebrows waxed in way too long (is that why he doesn’t like me? )….really just don’t matter. At all. Compared to the hugeness of that particular mountain and the reality that it’s just one mountain among thousands, my problems, my life, and myself in general suddenly gain a new perspective of smallness. I love feeling small; it’s one of the best “relief moments” I ever get. At work, all my computer backdrops are of 14er hikes. Any time I’m tempted to start freaking out about something that really isn’t a huge issue, I can look at the pictures and remember to feel small again. Plus, the views from the top are just incredible! Pictures just don’t capture it, but these might give a small taste. My “More-with-Less” cookbook is surprisingly diverse. I was expecting page after page of German and Midwestern recipes – read generally BLAND. However, many of the recipes were submitted by Mennonite missionaries from across the globe, so I found more appealing options than I expected. One recipe that has been unique to add to my rotation of regulars is Pakistani Kima. It’s basically a beef curry with other vegetables, served on rice. 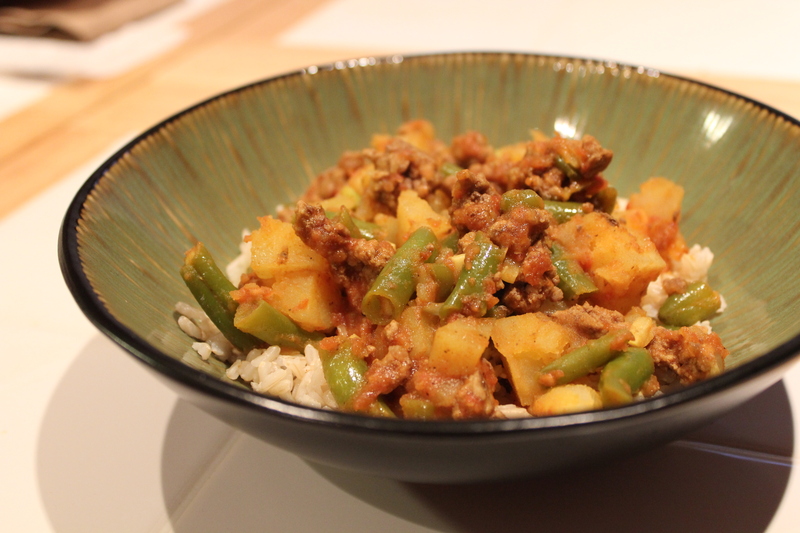 Still skeptical about the authenticity of a recipe from a Midwestern cookbook, I did a little research and found that keema is a traditional Indian and Pakistani dish with ground meat. I think this version is slightly Americanized, but the basics hold true. After making this a few times, I have tweaked the recipe a bit, so the following is my own edit. Cook onions and garlic in butter/oil. Add ground beef and cook until browned. Add all other ingredients and stir. Simmer for 25 minutes or until potatoes are tender. Serve over cooked rice. The “More-with-Less” recipe version calls for green beans or peas, and from what I’ve read the peas would be more authentic. But I prefer green beans. The spices provide great warmth and flavor; this is not a spicy curry. It’s easy prep and easy clean-up. I figured it comes to around $7 for ingredients, plus rice and spices I already had in my pantry. That is just over $1 per serving – wow! Even Hannah liked it, though she mostly went for the potatoes. Maybe she would have preferred it with peas.